In all my reading, it appears that the multi channeling is better than the multiple sets of speakers on the same audio output group using the built-in algorithms. It appears that routing by “like-sounding pipes” versus just divisions is better as well. We are proposing to run the Hereford Cathedral Set at the church. We have a MIDI equipped Rodgers with a single set of crappy speakers. Our sanctuary is old and small about 200 years old and 30’ wide and 60’ long. It would seat 100 if packed, we usually see 40-50 a Sunday. There is carpeting in all areas except for under the pews and the pews themselves are padded. I would love any input you have regarding the number of channels/routing and the sound system needed for a space like this. I have read most of the posts regarding the experimenting of channels, though most deal with 8 channels in the home setting. I am thinking of 16 channels but would love input on whether the space could benefit on 16 over 8 or is 16 just overkill. 15-16 Antiphonal in the back - Possibly some Solo stops like the Tuba, chimes, etc. Would mixtures be combined as a lot do with the pedal division or benefit from their own group? A lot in the congregation would like some sound from the back as well, and in all my research have not figured out if you can have something like that. I am thinking something like having channels 3 through 12 go to another set of channels, say a proposed 17-18, or combining all the flutes and principals together and using the extra two channels and keeping it at 16, and play at a much softer volume and have it in the back to fill the space better without blasting out the altar and front pews. I keep seeing people refer to mixing down and sending to another channel, but not sure what that is or if you are just limited to sending sound to one channel group. I would appreciate any help and guidance anyone could give me on this. SKresge wrote: In all my reading, it appears that the multi channeling is better than the multiple sets of speakers on the same audio output group using the built-in algorithms. It actually depends on the sample set. I've found the Paramount theatre organs and a few of the smaller, closed mic'd tracker organs work better with the algorithms. Hearing the chiff move across the speakers as you play a scale is quite impressive and adds to the realism. SKresge wrote: It appears that routing by “like-sounding pipes” versus just divisions is better as well. This design study was in done in a home installation. The venue, sample set, and speaker placement (chamber vs exposed) will determine which routing scheme is best for you. Fortunately with the different Alt Configs in HW, you can easily A-B-C compare. SKresge wrote: I have read most of the posts regarding the experimenting of channels, though most deal with 8 channels in the home setting. I am thinking of 16 channels but would love input on whether the space could benefit on 16 over 8 or is 16 just overkill. If you would wanted to incorporate larger 2 way, amplified passive speakers you could get by with less channels. You have an nice plan and 16 channels should be doable if you plan on using 8" active monitors. Having many channels adds to the realism and flexibility. The Hereford Cathedral Set is an excellent choice since I personally know 3 churches with VPOs who use it as their organ. I see you have a subwoofer listed in the pedal division. An easy hookup is to dedicate 2 channels as a mixdown so the sub will provide the necessary sound for any rank (i.e. manual 16' ranks) . The caveat is it will 'cost' you 2 channels. Since I don't know which audio interface you will be using, the 2 that come to mind are the Cymatic LP-16 and the MOTU 16A. It's possible to squeeze an extra 2 channels out of these units via the headphone jack and Toslink connector respectfully. Thus 18 channels. Another possibility is to have a pedal division 'system' that incorporates a set of speakers and subwoofer being served by only 2 channels. I like your initial routing design with the Antiphonal in the back. As requested here is an alternative routing design that uses 18 channels. Its a hybrid of divisional routing with a speaker array (2 channel stereo algorithm). For the 16' ranks in the manual divisions, you can incorporate the Bass Split feature to send the last 6 to 8 notes in the last octave to the pedal division channels. YMMV. SKresge wrote: A lot in the congregation would like some sound from the back as well, and in all my research have not figured out if you can have something like that. I am thinking something like having channels 3 through 12 go to another set of channels, say a proposed 17-18, or combining all the flutes and principals together and using the extra two channels and keeping it at 16, and play at a much softer volume and have it in the back to fill the space better without blasting out the altar and front pews. I keep seeing people refer to mixing down and sending to another channel, but not sure what that is or if you are just limited to sending sound to one channel group. Is there a balcony or gallery in the back? To be polite, the congregation is thinking of a PA or spoken word where the people in back can still hear. I would step back a moment and think of a pipe organ installation. Better yet, traditional Anglican pipe organ installs; organ in the front with 'effects' in the back as you have proposed. It's okay to have an En Chamade blast from the back as its usually high over everyone's head. Another choice would be to place the complete Echo division in the back. With the Antiphonal gone, the Echo would have a 2 channel stereo array like the other manual divisions. Depending on the equipment you choose and if your install is done correctly, congregants in front shouldn't be blasted even with large registrations. Speaker placement and firing direction play an important part here. The good news is that with 10 to 14 or more speakers it's possible to try a number of schemes to see what sounds best. I don't understand the rational behind creating multiple front groups, either by like-sounding ranks or divisions, and would allow the Hauptwerk multichannel algorithms to work to their fullest by providing a main group consisting of 5 or 6 speaker pairs. If there are sufficient speakers available then creating multiple front groups might be considered if they can be spaced apart enough to sound from a discernably different location, but using just two pairs in a group doesn't make full use of the HW routing schemes. When there's a need for either a rear location then a pair or two of speakers could be installed at the rear both for an antiphonal division and even possibly just a touch of reverb if the sanctuary is overly carpeted. I've heard large HW installations in dry American acoustics where just a hint of reverb would have added immensely to an authentic sound. Two speakers included for the pedal of course. That's the one division I'd create a separate group for. I'd route all the pedal ranks to this pedal group rather than using filtering to cross the ranks over to the main speakers. "it appears that the multi channeling is better than the multiple sets of speakers on the same audio output group using the built-in algorithms..... It appears that routing by “like-sounding pipes” versus just divisions is better as well." I will say yes and yes but it may depend some. Keep in mind, in my experiments it was all done in my home setting now consisting of a total of 10 channels in a room of roughly 12' x 12' at best with a few less than desirable features to mess up the sound. As far as using the built in algorithms go, being I am at close proximity to my front speakers, I did not particularly like the back and forth and up and down it produces of the stops sounding, this to me took away from the realism of the stereo picture as I was after a more stable stereo field, much like you'd hear if you were say, back in pew #10 at the church with the organ in front of you. In this circumstance you really don't hear much back and forth if any at all, especially if the space is quite reverberant. I will say this though, in a church setting where even the closest listeners will likely be quite a ways away from the speakers, I'd doubt anyone would detect the back and forth of the algorithms if you use them, maybe the organist at best would, but anyone out in the church would likely not. That being said, if you use the algorithms, even in a large setting, there to me is still one problem, and that is you're going to end up with reeds mixing with mixtures, flues mixing with nazards or what have you and sounding at the same time and from the same speakers even with the algorithm, this is something Hauptwerk will not divvy up and keep from sounding with each other from the same speakers. Hence the 'like sounding' routing scheme which of course you choose manually from the rank table when you first load the organ. In all my experimenting I found that doing your best to send given ranks to given speakers and grouped together with others of like sounding timbre works best. I did find it interesting that mixtures seem to work better in a speaker pair where the lower ranks like 16' reside (and even 32's), probably because of the vast difference in timbre and pitch between the two? They don't seem to affect each other much so that's my guess anyways, but it works. You can set up a separate pair of speakers for mixtures though if you have the audio channels, and I've done it this way with good results as well. Mixtures seem to be the least fussy of all the stops in terms of where they are sent and the general results I get is either the mixtures are more bright and jump out a bit more, or are somewhat subdued but still sound fine, something you will know once you experiment, but again if you're mixing them with something, they work best either with the very lowest sounding ranks, by themselves, or with 2' and above. Besides mixtures, as far as the other ranks go, I've found most if not all will work very nicely with each other to the same speakers, again as long as they're grouped together based on sound. As I mention above, I have a total of 10 channels, 2 of which are for rear surround, and 2 for the mix-down (of all) for the subs, so I'm actually using only 6 channels for actual rank routing. In my situation since I'm a bit limited for channels, I route all 32' and 16' to one pair and include the mixtures there or (read on), all 8' flue to a pair, all reeds regardless of which also to the same I send the 32' and 16' to, and in most cases depending on the set all 4' flue also to the same as the 8' flues, and anything higher in pitch 2' and above to the final pair. I do in some cases send the mixtures to the final 2' and above pair as well. Part of it is you have to look at it from the stand point of what stops get used when and with what other stops when contemplating as to where to send them if you're limited in channles. If it doesn't look like it's a good idea to mix reeds and mixtures together to the same speakers, then you have to ask yourself if you'd actually combine them in a given registration anyways. So even if a rank goes to the same speaker pair as an opposite sounding rank, it may not matter as you may not be drawing them at the same time. Of course, with additional channels to work with like it looks to be the case for you, then this concern is easier to deal with and I'd say even a total of 10 channels to route ranks to would be very good, would sound great, and would give you plenty of flexibility to avoid this situation. Yes, I've also experimented at length with sending divisions to speaker pairs, I found things get quite muddy as you add stops and the realism goes down as well, so for my tastes routing ranks to pairs based on like sounding works best and has the greatest clarity and realism. I can say this, I haven't found a better way yet and I've certainly tried a bunch of them! I've been tinkering with a new and somewhat slightly different audio layout for the Armley Schulze and have found some rather interesting outcomes that happen depending on how you do things, I may write about it soon, a bit more testing first though to verify my results. In any case, sounds like you have a good plan and have chosen a good sample set, I too might suggest the Armley Schulze as another good one to consider for church service, it's a wonderful church organ and the enhanced version really rocks! With 8 main channels (4 stereo pairs) and a sub-woofer( one stereo pair), if the 8 main speakers are the same and have the same amplification system, I would strongly suggest using creating one audio group with all four of the stereo pairs and use the Hauptwerk algorithm “Cycle within octaves, octaves and ranks cycled” for this output group. This will maximise the use of the 4 stereo channels you have allocated whilst reducing the Intermodulation Distortion you can get when pipes are sounded through the same speaker pair. For example if only one stop is being played across its compass it will use all of the channels: c- stereo pair 1; c# stereo pair 2; d stereo pair 3; d# stereo pair 4; e stereo pair 1… For a second stop c may be assigned to stereo pair 2; c# pair 3; d –pair 4; d# pair 1; e- pair 2… and so on. Note the allocation is static and made when the organ is configured. Create a stereo mix down in Hauptwerk for from all channels and send this to the sub-woofer stereo pair; the sub should only sound for the low frequencies s it receives in the mix down – the upper frequencies will (normally) be rejected by the sub-woofer’s electronics. With a limited number of identical speakers (and amps) , sited together, I think this gives a much better sound, a clearer sound then using one stereo pair per division or for a selection of stops. Try it in the church! If you have more output channels with speakers collocated you can increase the group size, or you could create two groups. jkinkennon wrote: I don't understand the rational behind creating multiple front groups, either by like-sounding ranks or divisions, and would allow the Hauptwerk multichannel algorithms to work to their fullest by providing a main group consisting of 5 or 6 speaker pairs. If there are sufficient speakers available then creating multiple front groups might be considered if they can be spaced apart enough to sound from a discernably different location, but using just two pairs in a group doesn't make full use of the HW routing schemes. In this thread we've made the assumption that all manual division speakers (or active monitors) would be identical. I did preface my thoughts that venue, sample set, and speaker placement can play a part in the decision. I agree that notes/ranks spread across 5 or 6 speakers pairs in a group should lend a bigger sound since they are sharing an equal audio load. I currently have 16 channels and have experimented extensively with 3 of my main sample sets in both configs: large audio group & separate by division. Being the die hard organ fan that I am, when comparing routing schemes I try not to let psychoacoustics interfere . . . . . . meaning something that sounds different is actually better. I did extensive testing (in my space) with my go-to sample set (Armley-Schultze) and even got assistance from a panel of organ friends. Under the guise of audio clarity (especially in heavy or full registrations), we felt the divisional routing sounded best. I haven't tried Marc's “like-sounding pipes” design yet but now looks like I should. That's awesome Marc! I'd would love to see your research having read your previous routing postings a few times now. Feel free to PM if you'd like. 1961TC4ME wrote: In any case, sounds like you have a good plan and have chosen a good sample set, I too might suggest the Armley Schulze as another good one to consider for church service, it's a wonderful church organ and the enhanced version really rocks! I second that plus its a little cheaper, newly recorded, and you have the Chancel and Nave samples to work with. First off, thanks to all the responses, lots of information to digest and think about this week. IainStinson wrote: With 8 main channels (4 stereo pairs) and a sub-woofer( one stereo pair), if the 8 main speakers are the same and have the same amplification system, I would strongly suggest using creating one audio group with all four of the stereo pairs and use the Hauptwerk algorithm “Cycle within octaves, octaves and ranks cycled” for this output group. This will maximise the use of the 4 stereo channels you have allocated whilst reducing the Intermodulation Distortion you can get when pipes are sounded through the same speaker pair. Thanks for the two links, really good and interesting read. Could I do this and still incorporate an antiphonal set or perhaps send the solo division to a back stereo set in addition to that if i have the available channels? Maybe set up an additional audio group for that set? but how would that affect those pipes/solo division with the front audio group for the set of 8 speakers that you cycle with the algorithm? Also could the above set up support two identical subs set up in the fashion they stated? Of course they would have to be on another stereo channel, say 11 and 12 in the above configuration. The chancel takes up the a huge middle section in the front of the church and was thinking of putting two subs elevated on either side for balance under the two sets of four on either side. Felt just putting one on the side wouldn't support the area. IainStinson wrote: With a limited number of identical speakers (and amps) , sited together, I think this gives a much better sound, a clearer sound then using one stereo pair per division or for a selection of stops. The Paramount .pdf is great and sounds like 8 speakers up front would be optimum. You state that if i had more output channels i could increase the group size, how would that benefit above and beyond the 8? little confused there. And you suggest adding groups, would this be something like two groups of the identical 8 referenced above or like i was asking about assigning an antiphonal or division in the back? Thanks again for all this great input, but it sounds like from some of the responses and research i have done so far, with 16 channels I could experiment with this set up and even try the divisional and like sounding pipes set up with the different Alt-Config's?? 8 speakers in a slightly larger church. Plus a sub in a corner. Thanks Ed for that photo and info. 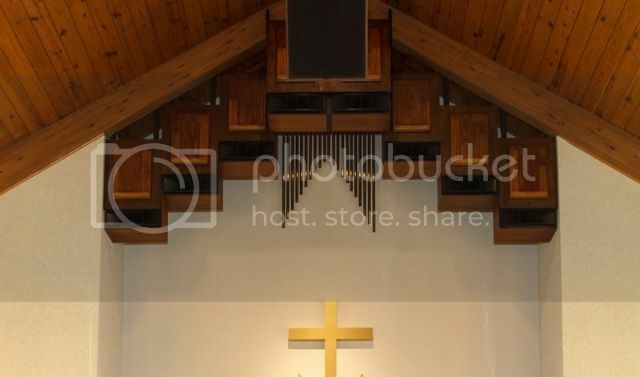 I tried to find a picture online to post above our altar and don't have one. We have one rectangular stained glass above the altar and then up in the apex where you show those speakers we have a large circular rose window. It is a 200 year old church as I was trying to go with a recommendation of sets on either side of the chancel and blend into the environment as much as possible. Which continues my dilemma of where to place a singular sub or is it actually possible to have two matching subs in the above discussed Paramount set up just on another stereo channel, say 11-12. So does anyone know if it is possible to have two subs work together in a configuration in the Paramount recommended audio configuration by setting up two more channels like 11, 12?? Truly don't have a 'middle' space to place just one, will have to be pretty far off to one side. Or will two subs cause distortion and not really work well together? Also is it possible to have the one audio group cycle through the four speaker pairs like suggested above and have a separate audio group, say an antiphonal for some instrument(s) or the solo division to the back of the church? For the multiple sub question, the HW part would be straight forward: I would create a mix down from all of the output groups and assign this to a sub woofer group. You could then allocate a number of sub woofer "speaker channels" to that group. If you attached two (or more) sub woofer "device" to these channels, I can't see any obvious problems though phasing may be an issue depending on the properties of the room (my sub allows me to adjust the phasing (which I use to adjust the phasing between the main speakers and the sub). I have no real experience of setting up multiple subs - others may be able to give better advice. http://forum.hauptwerk.com/viewtopic.php?f=6&t=17034&hilit=Here%2A and other relatedposts by ajt. The only installation that needed 2 subs was a large auditorium seating 1200. In that case I used 2 HouseWreckers each with a 1000 watt plate amp. Hardly any noticeable difference when one was turned off. This since those lows are non directional. Found a "little low" goes a long way. Plus in that installation, the higher pedal tones were distributed to other speaker groups. BTW those subs had each 4 - 18" drivers. Not exactly wimpy. The concrete floor help the distribution which could be heard (and felt) outside. And yet, the lows were not overly loud. Sub amp level controls were approx 1/3 "way open". Thanks for all your help, I now know what direction i want to head in.